All the best bars, in my opinion, are low-lit spots with dark furniture and more than a whiff of the clandestine about them. You know you are on to a winner when you also get an up-for-it crowd and a carefully chosen selection of drinks mixed by people who take pride in what they do. Bar 63 is such a winner. 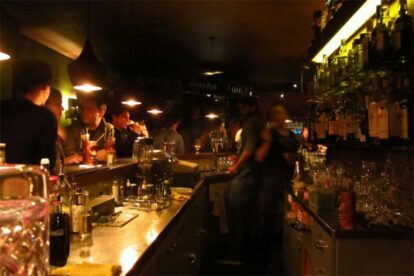 It’s located just off Langstrasse surrounded by a number of dodgy-looking drinking establishments adding an urban edge. As you can tell from the photo, it delivers where dim lights and dark interior are concerned. Service is knowledgeable, swift and friendly without getting too chummy. The best thing about Bar 63 is the drinks menu. Rums and wines are the specialty, the former featuring prominently in their lethal Punch 63 house special. They also offer a mile-long list of whiskies and unusual spirits, and their drinks menu changes every season. The crowd consists mostly of thirty-something creative types turning up in twos for a chat and a sip of fine wine. While the big party is usually taking place elsewhere, at Bar 63 you are only ever a few steps – or house specials – away from it.